Read 2 times. Last read October 11, 2017. I'm not a great re-reader of books, but there are some whose very individual style and premise merit a revisit. This elegant, charming, cryptic little novella will not cost more than an hour or so of your time. Yet it will amply repay the investment with beautiful prose and an absorbing story. Original review follows - and I still stand by every word. I was first aware of Laura M Hughes as an entrant in a short story competition on Thatthornguy where I thought her 300 word piece of flash fiction on Life and Death was particularly noteworthy - a humorous lively style in a dark context. I hadn't realised until today that Hughes had written a somewhat longer piece, this 56 page novelette, which I bought and devoured in a small hours of the morning of bedtime reading. This piece more than fulfils the promise of glimpse afforded by the competition with high quality writing and lots of points where I stopped to make a note. For example in the line - "She placed a sensible hand on her right hip and tilted her head, just like mama did." - I loved the way adding the word "sensible" economically created a perfect image of the young girl's stance. I have always thought the mark of true quality (genius if you like) in any endeavour is the economy of effort to achieve an outcome. The two deft touches on a football with which a striker scores an outstanding goal, the simple lines with which an artist conjures a perfect image, and the clean simple use of language - not complex words, not convoluted sentences - but ordinary words each skillfully placed to punch above its weight. Thinking of this I had a slight meta-moment when I read the line "His voice was that of the Serpent, and her mamma had always told her to beware those who used too many words." Another line that tickled me "The other girl subsided, grumbling something about how, when God created the world, he should have made sure there were enough decent dresses to go around." Certainly Hughes does not use too many words, but this is still an ingenious and captivating piece. A young girl in a graveyard is haunted by a demanding apparition and - in strange ways - counselled by a snail and a crow as she sets about a quest. The first chapter number you see is number 10 - which might make you wonder if you have missed something. However, it is all part of a captivating story - in some ways a series of vignettes - in which we follow the girl Blue through dark memories and darker challenges. Even now, re-reading bits of it, I am struck by the careful structure that lies beneath an ethereal tale, like the outline of furniture beneath a ghostly sheet. For example in a foreshadowed reference to oranges that goes on to haunt the story. There are others, cruel jibes with which fate taunts the protagonists, but to mention more would be to throw in some spoilers and this is a well written story that I would not wish to spoil for anyone. 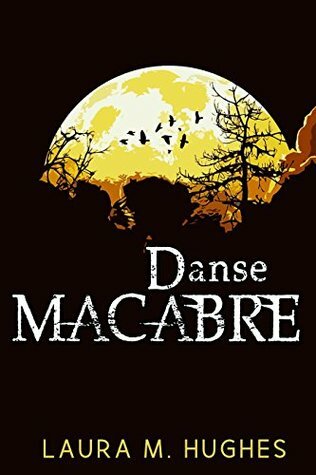 Sign into Goodreads to see if any of your friends have read Danse Macabre. "Even now, re-reading bits of it, I am struck by the careful structure that lies beneath an ethereal tale, like the outline of furniture beneath a ghostly sheet." One day, T.O., my fiction will be as good as your reviews. I hope.